“Purple coneflower” redirects here. This common name is sometimes used for other purple flowered plants in the genus Echinacea. 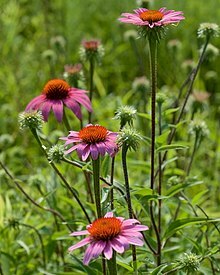 Echinacea purpurea (eastern purple coneflower, hedgehog coneflower, or purple coneflower) is a North American species of flowering plant in the sunflower family. It is native to eastern North America and present to some extent in the wild in much of the eastern, southeastern and midwestern United States as well as in the Canadian Province of Ontario. It is most common in the Ozarks and in the Mississippi/Ohio Valley. Echinacea purpurea is an herbaceous perennial up to 120 cm (47 in) tall by 25 cm (10 in) wide at maturity. Depending on the climate, it blooms throughout spring to late summer. Its cone-shaped flowering heads are usually, but not always, purple in the wild. Its individual flowers (florets) within the flower head are hermaphroditic, having both male and female organs in each flower. It is pollinated by butterflies and bees. Its habitats include dry open woods, prairies and barrens, as well as in cultivated beds. Although the plant prefers loamy or sandy, well-drained soils, it is little affected by the soil’s pH. Echinacea purpurea is also grown as an ornamental plant, and numerous cultivars have been developed for flower quality and plant form. The plant grows in sun or light shade. It thrives in either dry or moist soil and can tolerate drought once established. The cultivars ‘Ruby Giant’ and ‘Elbrook’ have gained the Royal Horticultural Society‘s Award of Garden Merit. Echinacea purpurea can be propagated either vegetatively or from seeds. Useful vegetative techniques include division, root cuttings, and basal cuttings. Clumps can be divided, or broken into smaller bunches, which is normally done in the spring or autumn. Cuttings made from roots that are “pencil-sized” will develop into plants when started in late autumn or early winter. Cuttings of basal shoots in the spring may be rooted when treated with rooting hormones, such as IBA at 1000 ppm. Seed germination occurs best with daily temperature fluctuations or after stratification, which help to end dormancy. Seeds may be started indoors in advance of the growing season or outdoors after the growing season has started. Slugs eat this plant. Rabbits will also eat the foliage when young, or shortly after emerging in the spring. Additionally, roots can be damaged and eaten by gophers. Echinacea purpurea contains multiple substances, such as polysaccharides, caffeic acid derivatives (including caftaric and cichoric acids), alkylamides, and glycoproteins. In indigenous medicine of the native American Indians, the plant was used externally for wounds, burns, and insect bites, chewing of roots for toothache and throat infections; internal application was used for pain, cough, stomach cramps, and snake bites. The plant is important economically, to the pharmaceutical trade. It is purported that all parts of the purple coneflower stimulate the immune system. Well-controlled trials studying these uses are limited and low in quality. Study results are mixed on whether preparations including Echinacea can be useful for upper respiratory tract infections including colds. Side effects include gastrointestinal effects and allergic reactions, including rashes, increased asthma, and life-threatening anaphylaxis. ‘Echinacea’ is derived from Greek, meaning ‘spiny one’, in reference to the spiny sea urchins ‘εχίνοι’. ‘Purpurea’ means ‘reddish-purple’. ^ a b Flora of North America, Eastern purple coneflower, Echinacea purpurea (Linnaeus) Moench, Methodus. 591. 1794. ^ a b c Midgley, Jan W. (1999). Southeastern Wildflowers: Your complete guide to plant communities, identification, and traditional uses. Crane Hill Publishers. ISBN 978-1-57587-106-6. ^ a b c d e “Echinacea purpurea – (L.)Moench”. Plants For A Future. June 2004. Retrieved 2007-06-06. ^ a b c Bruce Zimmerman. Echinacea: Not always a purple coneflower. ^ a b “Echinacea purpurea (L.) Moench (eastern purple coneflower)”. PLANTS Profile. United States Department of Agriculture Natural Resources Conservation Service. Retrieved 2007-06-07. ^ “RHS Plant Selector – Echinacea purpurea ‘Ruby Giant‘“. Retrieved 16 July 2013. ^ “RHS Plantfinder – Echinacea ‘Elbrook‘“. Retrieved 14 February 2018. ^ “AGM Plants – Ornamental” (PDF). Royal Horticultural Society. July 2017. p. 33. Retrieved 6 February 2018. ^ Carey, Dennis; Avent, Tony. “Echinacea Explosion – The Purple Coneflower Chronicles”. Plant Delights Nursery Article. Plant Delights Nursery. Retrieved 2015-07-12. ^ “Echinacea – How To Grow Purple Coneflower”. Growit Buildit. Retrieved 25 September 2018. ^ Manček, Kreft S (2005). “Determination of cichoric acid content in dried press juice of purple coneflower (Echinacea purpurea) with capillary electrophoresis”. Talanta. 66 (5): 1094–1097. doi:10.1016/j.talanta.2005.01.028. ^ Wang L, Waltenberger B, Pferschy-Wenzig EM, Blunder M, Liu X, Malainer C, Blazevic T, Schwaiger S, Rollinger JM, Heiss EH, Schuster D, Kopp B, Bauer R, Stuppner H, Dirsch VM, Atanasov AG (2014). “Natural product agonists of peroxisome proliferator-activated receptor gamma (PPARγ): a review”. Biochem. Pharmacol. 92 (1): 73–89. doi:10.1016/j.bcp.2014.07.018. PMC 4212005. PMID 25083916. ^ Hart A, Dey P (2009). “Echinacea for prevention of the common cold: an illustrative overview of how information from different systematic reviews is summarised on the internet”. Preventive Medicine. 49 (2–3): 78–82. doi:10.1016/j.ypmed.2009.04.006. PMID 19389422. ^ Sachin A Shah; Stephen Sander; C Michael White; Mike Rinaldi; Craig I Coleman (July 2007). “Evaluation of echinacea for the prevention and treatment of the common cold: a meta-analysis”. The Lancet Infectious Diseases. 7 (7): 473–480. doi:10.1016/S1473-3099(07)70160-3. ISSN 1473-3099. PMID 17597571. ^ Woelkart K, Linde K, Bauer R (May 2008). “Echinacea for preventing and treating the common cold”. Planta Medica. 74 (6): 633–7. doi:10.1055/s-2007-993766. PMC 4068831. PMID 18186015. ^ Karsch-Völk M, Barrett B, Kiefer D, Bauer R, Ardjomand-Woelkart K, Linde K (2014). “Echinacea for preventing and treating the common cold”. Cochrane Database Syst Rev (Systematic review). 2 (2): CD000530. doi:10.1002/14651858.CD000530.pub3. PMC 4068831. PMID 24554461. ^ a b “Echinacea”. National Center for Complementary and Integrative Health. Abouelella A, Shahein YE, Tawfik SS, Zahran AM (2007). “Phytotherapeutic effects of Echinacea purpurea in gamma-irradiated mice”. J. Vet. Sci. 8 (4): 341–351. doi:10.4142/jvs.2007.8.4.341. Koen FE (1953). “The Influence of Echinacea Purpurea On The Hypophyseal-Adrenal System;”. Arzneimittel-Forschung. 3: 133–137.